Glaucoma is the second leading cause of blindness. Over 3 million Americans and over 60 million people worldwide have glaucoma, with experts estimating that half of those people aren’t even aware that they have it. Glaucoma affects the optic nerve, the network of nerves that connect your retina to your brain. 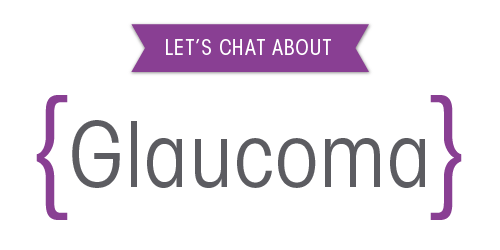 The most common type of glaucoma is linked to a build up of pressure in the eye which can damage your optic nerve. This eye pressure is what your optometrist measures with the “eye puff” test when you come in for your yearly exam. Without treatment, glaucoma can cause blindness. Early on, there are no symptoms of glaucoma, which is why it is so important for people in high risk groups to have their eyes checked. There is no pain, and often times people don’t realize there is a problem until their vision becomes compromised. Patients can start to lose their peripheral vision first, resulting in what can be called “tunnel vision.” Damage to the optic nerve can not be reversed and causes permanent vision loss. Glaucoma can develop in one or both eyes. Glaucoma can be detected through several tests including visual acuity, visual field testing (testing your peripheral vision), a dilated eye exam to check your retina and optic nerve for signs of damage, and a tonometry test, most commonly known as the eye puff test. EyeCare Specialties is one of the few local clinics that have all the most current tests necessary to diagnose and treat glaucoma. If you have high eye pressure, your doctor will want to check you for additional symptoms of glaucoma. There is no cure for glaucoma, but it can be treated and controlled with early detection. Doctors may recommend prescription eye drops to reduce the build up of eye pressure. Laser or microsurgery can help allow fluid drainage in the eyes, also reducing eye pressure. Sometimes doctors recommend a combination of treatments to reduce the effects of the eye pressure on the optic nerve and toslow the progression of the glaucoma. To gauge your risk of developing glaucoma or to find out more about how to slow its progression, visit your EyeCare Specialties optometrist today.